60 experts. 60 seconds each. 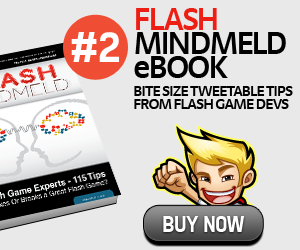 60 tips for being successful in the flash game market. What Makes or Breaks A Great Flash Game? That's the question I asked 60 of the greatest minds behind flash games. Hear from your favorite developers like: Brad Borne, Tom Fulp, Chris Harris, Stephen Harris, Chris Benjaminsen, Joel Breton, Terry Brown, Raigan Burns, Chris Condon, John Cooney, Chris Hughes and Sean Cooper. The amount of content you'll find in each eBook. The entire audio of each expert, transcribed and edited so you can bring your new secret weapon with you wherever you go. 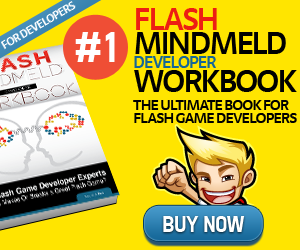 Get bite size tips on what Makes or Breaks a succesful Flash game from your favorite developers like: Brad Borne, Tom Fulp, Chris Harris, Stephen Harris, Chris Benjaminsen, Joel Breton, Terry Brown, Raigan Burns, Chris Condon, John Cooney, Chris Hughes and Sean Cooper. Hours of interviews with these experts are boiled down into memorable, shareable, tweetable, bitesize tips. Hear all 60 Flash game developer gurus answering in their own voice "What Makes Or Breaks A Great Flash Game with the full mp3 file of the event. Everything in the entire eBook is interactive and clickable. From the expert's games to wikipedia articles, you no longer will find yourself googling consistently while reading. Get the inside look at all 60 experts in the event. Their personal blogs, twitter and facebook pages and even their own favorite games are found within this priceless directory. © 2011 OBTO Tech All rights reserved.